Not only does the amazing Whanapoua Sled House close itself up against the elements when it's not in use, but it's actually built on sleds so that it can be moved around the New Zealand beach on which it rests. 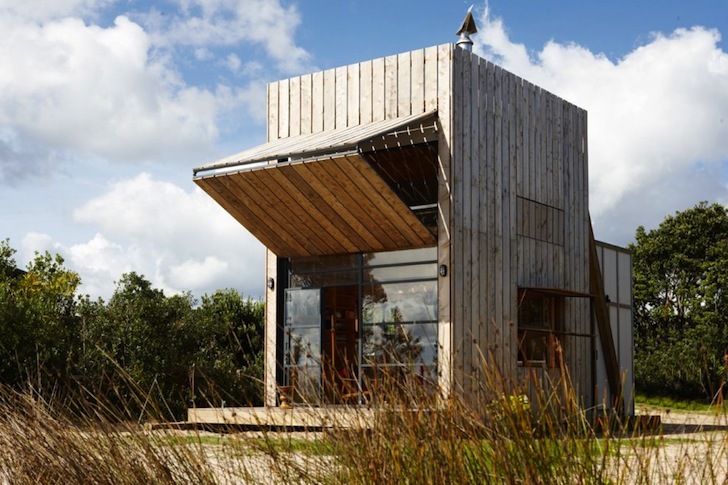 Crosson Clarke Carnachan Architects was tasked with creating the ultimate holiday home for a family of five, but because they wanted to build in a coastal erosion zone on the Coromandel peninsula, the building had to be moveable. It also had to be super efficient, so not an inch of space is wasted, mostly natural materials were used in the construction and it features a sustainable water-saving waste treatment system. Reminiscent of surf shacks or beach observation towers, the Whanapoua sled house features elementary building materials put together in a really sleek design. This is a two-storey project complete with dining, kitchen, living and bathroom space along with two bedrooms. One room holds three-tiered bunk beds for the children, while the mezzanine room overlooking the water is reached by a simple ladder. And when the family isn’t using the hut, everything boards up and blends in among the dunes. 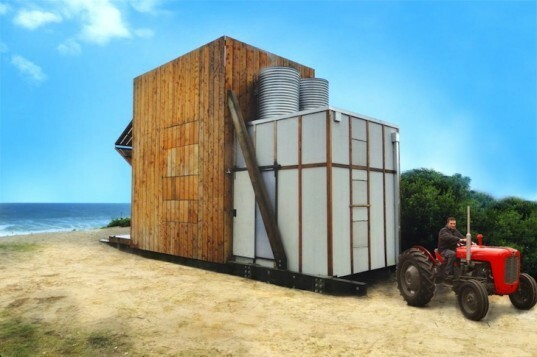 The ultimate solution to homes that are vulnerable to rising seas, the 40 square meter home is perched on two thick wooden sleds that allows its owners to move it as required by local planning regulations. A worm tank system treats the family’s waste while two tanks hold grey water that can be recycled. One of the shutters doubles as an awning that protects against the harsh summer sun while also allowing winter sun to permeate the interior, and a small wood-fired stove keeps the tiny space nice and warm. This is the ultimate holiday home. This home fits a family of five!